Rookie Marc Marquez (Repsol Honda Team) has collected his third MotoGP pole position for this weekend’s eni Motorrad Grand Prix in Germany ahead of Monster Yamaha Tech3’s Cal Crutchlow and Yamaha Factory Racing’s Valentino Rossi. Since practice commenced on Friday, there have been a number of incidents at Sachsenring. Dani Pedrosa injured his left collarbone by crashing in Free Practice 3 on Saturday; the Spaniard lost control on the exit of Turn 1, suffering a hard impact with the tarmac after flying into the air. He was airlifted to hospital where CT scans revealed a minor fracture to the left collarbone. Jorge Lorenzo’s accident had come on Friday, bending the plate attached to his already injured left collarbone. If Dani feels he can race medical staff will re-evaluate his condition, and if given the go-ahead will start from 12th on the grid by virtue of his lap times from combined practice which submitted him to the Q2 shootout. Meanwhile Jorge has now revealed that he is set to miss two races before making a comeback at Indianapolis in mid-August. Marquez’s lap of 1’21.311 was within three tenths of a second of Casey Stoner’s best ever lap of the Sachsenring – which had been achieved in the era of qualifying tyres in 2008. 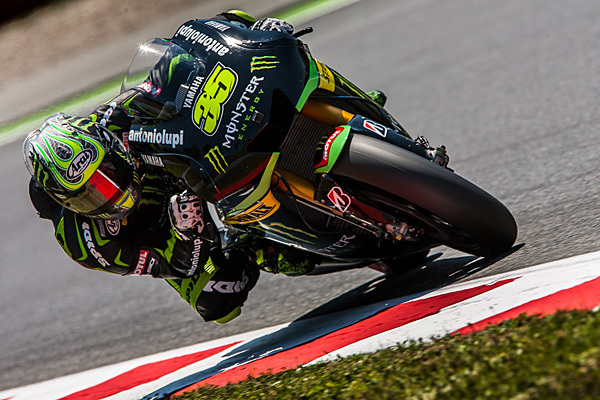 Crutchlow will start inside the top two for the third race in succession, despite two heavy falls on Friday which has left the Englishman in considerable pain, while the front row start for Rossi is his first in 988 days; his last had been at the Portuguese Grand Prix of 2010. Cal Crutchlow gets a front row start despite two heavy crashes on Friday. Row 2 is headed up by LCR Honda MotoGP’s Stefan Bradl at his home event, whereas a top five result came thanks to a stunning effort from Aleix Espargaro on the Power Electronics Aspar CRT machine. Ducati Team will line up sixth and ninth, better than Nicky Hayden and Andrea Dovizioso had expected, whereas Tech 3’s Bradley Smith and GO&FUN Honda Gresini’s Alvaro Bautista will fill slots seven and eight. 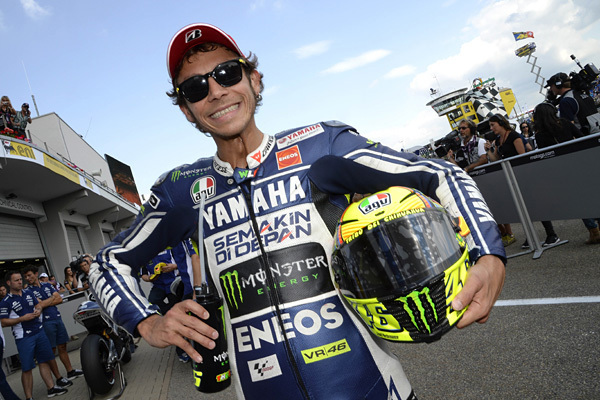 Valentino Rossi to start from third position on the grid. Highly impressive performances from Danilo Petrucci and Claudio Corti saw the pair of Italians topping Q1 and thus progressing to the Q2 shootout for the first time; Corti will start tenth on the grid for NGM Mobile Forward Racing, whereas Petrucci experienced an issue in Q2 and will set off from 11th for Came IodaRacing Project. At the back of the grid and in 23rd place will be Energy T.I. Racing’s Andrea Iannone, who dislocated his right shoulder in a crash during the final practice session. Hector Barbera (Avintia Blusens, 14th) was also in discomfort after twisting his right ankle in morning practice, whereas GO&FUN Honda Gresini’s Bryan Staring was left 22nd fastest after suffering a large highside on the exit of Turn 3.